The second test between India and New Zealand just concluded at Hyderabad earlier this week and it was another boring draw. India, who were expected to roll New Zealand over considering the huge difference in the rankings have found this series pretty hard till now. With two draws in two games, the kiwis will be swelling with pride as none of the teams baring South Africa have gone away from India with a drawn series in recent times. The major problem for the home team has been the pitches and the lack of bite in the bowling department. India has always been a tough place to tour for the western teams but in recent times with pitches getting flatter, teams have started to adapt much better. New Zealand has always done well in India as their previous tour was also a drawn series. Did the Indian team expect an easy series? Probably yes. Even though all the Indian players came in the media and claimed that they were not taking the Kiwis lightly, I am sure in their minds they thought it was going to be a piece of cake. The intensity was missing and the players seemed to go through the motions. It was just couple of brilliant innings from Harbajan which has helped India from trailing in this series. So two draws in two games, which has been a very rare sight in the past year or so in India. Almost every series has produced a result and most of the games have been result oriented. So if we analyze closely, the problem is that both the teams have struggled to bowl out the opponents on flat pitches. Indians always have had issues with their bowling and it has shown through in this series. Harbajan has struggled to pick wickets, Sreesanth has been very inconsistent, and Ojha has been steady but doesn’t seem like someone who will run through sides. New Zealand again is a one man bowling team, in spite of an inspired spell by Martin in the first test; they still rely heavily on Vettori to pick wickets. Indian bowling though has been really disappointing, especially in the second test. 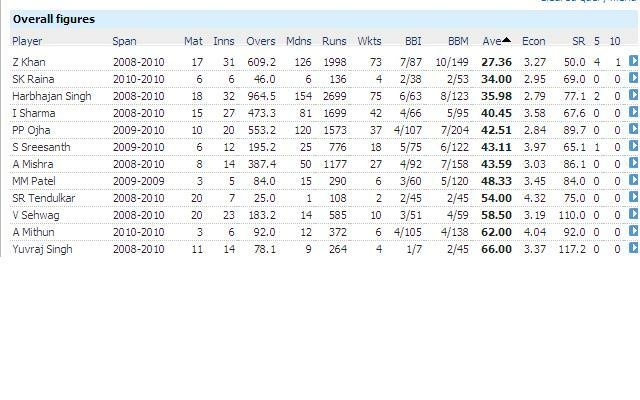 If you look at the list you will see that Zaheer has been exceptional, considering that India has played most of the games in the subcontinent. But the rest have been pretty ordinary. India’s premier spinner Harbajan averages little over 35 and the rest to put it mildly, have been mediocre. So how have India been winning games? Well the answer is pretty simple, the batting. Indian batsmen have been in supreme touch over the past couple of years and they have racked up huge scores. When India batted first they have scored big and even when they had to chase a big score they have matched the opponent or scored more than them. So the Indian bowlers have had the luxury of picking up wickets at an expensive average. So on an average the Indian bowling combination (Zaheer, Sreesanth/Ishant, Ojha and Harbajan) has to concede 374 runs for their 10 wickets going by their record over the last 2 years. It’s Hardly a mark of a top ranked test team.